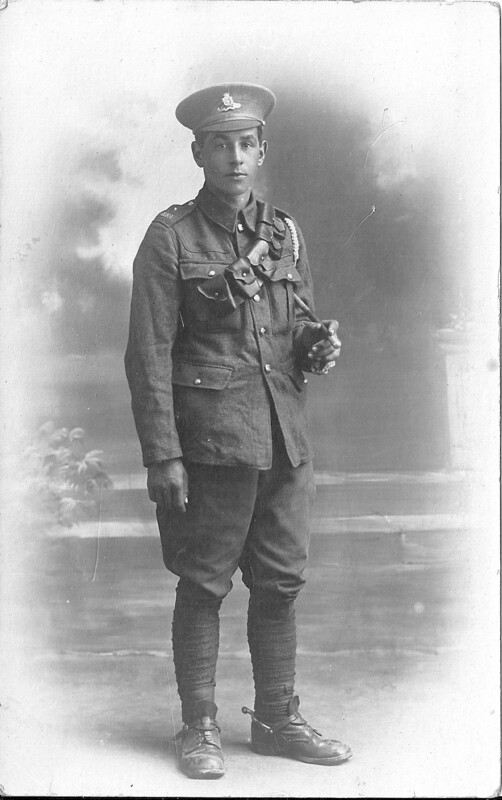 Private William James Hickman was born at Iping in 1899, the son of a paper worker at the Iping paper mill. He enlisted at Colchester initially into the Essex Yeomanry but was subsequently transferred to the Kings Own (Royal Lancaster) Regiment. He was killed in action in October 1918 at a time when his regiment was involved in the “Pursuit to Mons”, a phase in the final advance in Artois. William James Hickman was born in the second quarter of 1899 in Iping and his birth was registered in the Midhurst registration district. He was the third of six children. His father George Hickman (1869 – 1918) was himself born in Chithurst, in the adjoining parish. His mother, Georgina Stacey (1873 – 1951), was born in Iping into a family of agricultural workers and baptised there in 1873. She had a younger brother also named William James and our subject was probably named after his uncle. In 1891 George Hickman was living with his widowed father William and other siblings at 4 Queens Corner, Iping and he is listed as a paper maker. At this period there was a working paper mill in Iping. This had been established in the eighteenth century but by the 1890s it specialised in the production of blotting paper. In 1894 George married Georgina Stacey and their first son Henry was born soon after. By the 1901 census the family was living with Georgina’s widowed father, a cowman, at Lambourne Lane, Iping and George was working as an assistant cowman. In 1911 the family was still living in Iping in a 9-room dwelling with five children all at home, together with two of George’s brothers. George had gone back to work as a paper maker and his eldest son and one of his brothers also worked at the paper mill. William James was now 12 and presumably still at school since he has no listed occupation. William James Hickman enlisted at Colchester and appears to have initially had Service No. 2929 with the Essex Yeomanry. At his death he was serving under No. 41050 with the Kings Own (Royal Lancaster) Regiment. In the latter part of 1918 the regiment was part of 164th Brigade 55th (West Lancashire) Division. After April 1918 following the German spring offensive, the division made a stand at Givenchy and there is a memorial there to the West Lancashire Division marking the end of the spring offensive. From 2 October to 11 November 1918, the regiment was engaged in the “pursuit to Mons”, a phase of the final Allied advance in Artois. On 2 October, La Bassée was occupied and the Haute Deule canal was crossed a fortnight later. By 11 November, the division had advanced 50 miles in 80 days. Sadly, William James Hickman was killed on 4 October during this action. He was buried at Rue-Petillon Military Cemetery, Fleurbaix. This cemetery is 5 kilometres south west of Armentieres in the Pas de Calais. It was used as a cemetery from December 1914 but fell to the German offensive in spring 1918. It was recaptured in September 1918 and many of those buried here had died of wounds at the nearby dressing station known as Eaton Hall. It is sad to note that his father George had died in the summer of 1918 at the age of 47 so the death of William so close to the end of the war must have been a double blow for the family. The Iping War Memorial also commemorates the death in May 1940 of Frederick John Hickman aged 23. He was the youngest brother of William James Hickman having been born in 1917. He was with the Royal Sussex Regiment covering the retreat of the British Expeditionary Force towards Dunkirk when he was killed in action. His body was buried in the churchyard at Gijzelbrechtegem in Flanders. William’s sister Violet married Edward Eldridge at Iping church and they both worked at the Iping paper mill. Their son, Roy was born at School House, Iping in 1943 and still lives in the adjoining parish of Stedham. He provided the photograph of William James Hickman shown above.